Today's Delhi Times had something very interesting and exciting at the same time. 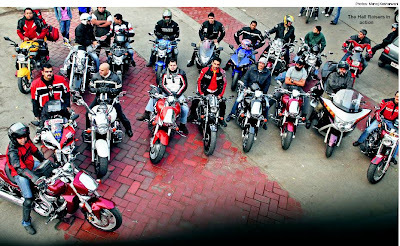 It's the Bucks, Bike etc write up covering some prominent personalities like Shiv Karan Singh and Naveen Ansal. 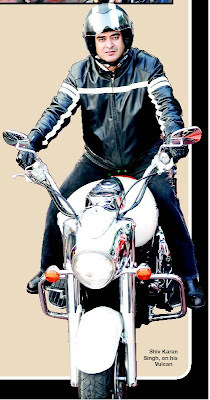 On one side where Shiv Karan Singh expresses his enthusiasm and excitement towards his Vulcan with the lines - "Believe me, when people halt, turn around and look at you when you start your bike, it is a special kind of high. 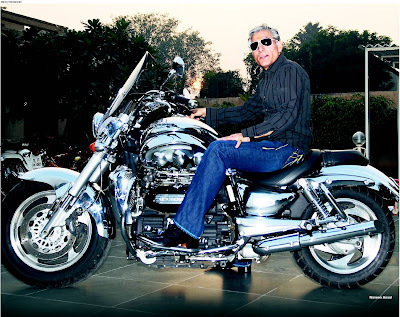 I’ve seen jaws drop, and also amusement, as they see us riding such heavy bikes on the busy Delhi roads.". Comming together with his "Biker Gang" and bikes moving through Delhi's Cannaught Place, Ashram Road, Nizamuddin or on the DND fly-over, the bikers try to make the most out of the week-end. It's not the size the of the bike, it's the passion here that's more touching. Rich and Successful Businessmen of the city, downing leather instead of the designer suits and having their chill out. People who live the entire 5 days of the week, for the last two days, when they and their machine hit the road, go for a spin and don't care for anything. A perfect way to settle out the week that past and prepare for the week that's coming.